« Need a Handyman in Maryland? We Can Help! Damaged curbs are unappealing and dangerous. Springtime is all about curb appeal. So, how are your curbs looking? When many people think of curb appeal, thriving landscape elements and beautiful home exteriors come to mind. Investing in curb appeal is essential if you want to maintain the beauty, safety, and inviting nature of your property. Curb appeal is equally as important for commercial property owners as it is for homeowners – perhaps even more important. Let’s talk about how we can help with your commercial concrete curb repair and replacement. Is Repairing Concrete Curbs Important? 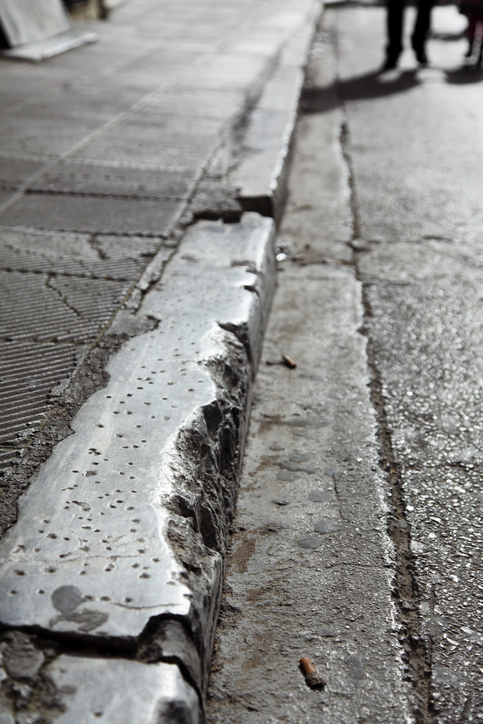 To put it simply – YES, repairing concrete curbs is critical for your property. Not only are damaged and broken curbs unsightly, but they can present highly unsafe trip-fall hazards to the people traveling on your property. If someone sustains an injury on your property because of this, you could be held liable and find yourself in a costly debacle. Once your concrete curb begins to crack or crumble, it is important to have it repaired or replaced immediately. Aside from increasing safety, curbs that are intact and well maintained give people a great impression of your business and can enhance your reputation rather than hindering it. What About Concrete Sidewalks and Ramps? If your concrete sidewalks or ramps are damaged or broken, repairing them is also critical for the safety of your visitors. What’s the point in repairing a broken curb just for a visitor to step foot onto a broken sidewalk? Getting your concrete surfaces fixed is not something that should be taken lightly or looked at as a spring cleaning task that you’ll “get around to.” We’d like to stress the importance of urgency regarding concrete repair and replacement to all property managers before the unthinkable happens. At Atlantic Maintenance Group, our expert staff can help you repair your concrete sidewalk and effectively ensure that your concrete ramp is ADA compliant and fully functioning. Don’t live in Maryland? No problem! We also provide handyman services in Virginia, Delaware, and Pennsylvania. Expert advice, installation, and care is a key factor in maintaining the integrity of your property year-round. The Atlantic Maintenance Group offers quality landscape, asphalt, snow removal and concrete maintenance services. This entry was posted on Friday, May 20th, 2016	at 8:16 pm	and is filed under Curb Appeal	. You can follow any responses to this entry through the RSS 2.0	feed. Both comments and pings are currently closed.